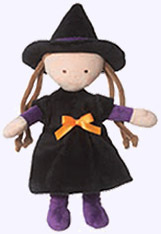 Little Witch Plush Doll: Adorable Little Witch has long brown pigtails. She has a purple shirt under her black dress, which is sewn on., and little purple boots. She stands 10" tall. Little Vampire Plush Doll: Little Vampire sports a red and black velour cape. At 10" tall he is perfect for trick or treating or reading scarry stories. 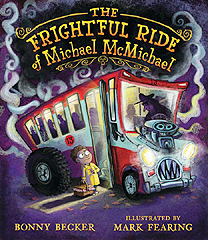 The Frightful Ride of Michael McMichael: When the Thirteen bus pulls up one dreary, stormy evening, something about it doesn't seem quite right. The driver grins down with a mouthful of long, white teeth, and there's barely any room to sit, but Michael McMichael is bringing his gran something very dear, so he gets on board despite his misgivings. But as they travel on and the rest of the passengers get off, Michael realizes there's nothing normal about this bus  and the driver is getting creepier by the minute. Best-selling author Bonny Becker's cleverly rhyming text will chill and thrill readers alongside Mark Fearing's wonderfully funny illustrations, making this book perfect for Halloween story times  and lovers of things that go bump in the night. Hardcover Picture Book Ages 4 - 6. The Witch's Walking Stick: Ever since Margaret's parents died, her brother and sister have made her sweep the floors, chop the wood, cook the meals, feed the pigs, and anything else they can think to demand. Selfish, mean, and twice as big as Margaret, they always get their way. 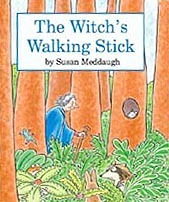 When Margaret has had enough, she runs away into the forest and comes upon an old lady with a very sad story: a dog has run off with her walking stick, and she can't do a thing without it. The old lady promises Margaret a reward of three gold coins for its safe return. Little does Margaret know that the old lady is really a witch, her reward a trick, and her walking stick a magic stick the witch has used to make a thousand miserable wishes come true . . .
Hardcover Picture Book. Ages 4 - 6. Autographed Book Plate by Susan Meddaugh. Very Short Scary Tales to Read Together: Do you like your mind all jumpy? Do you like your skin all bumpy? If you do, then take a look at the stories in this book. - I'll read here and you'll read there. - Both sides give you quite a scare. - Then with middle words before us, read together in a chorus. - So now we know just what to do: You'll read to me! I'll read to you! 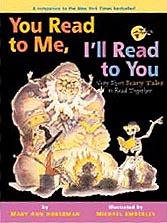 In this irresistible fourth You Read to Me collection, spooky tales are a scary lot of fun. You've never met witches, zombies, ghosts, or ghouls like these before! Hardcover Picture Book. Ages 3 - 6. Scaredy-Cat, Splat! It's Halloween, and Splat is determined to be the scariest cat in the class. Unfortunately he's just too much of a scaredy-cat. He's afraid of a little spider, and everyone says his costume looks more silly than scary. 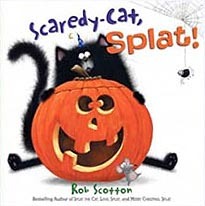 And when Mrs. Wimpydimple tells a ghost story in the dark, Splat gets so frightened that he tips over his jack-o'-lantern. But when the lights go back on, the entire class is scared silly by a small, black, furry creature with a big pumpkin head. Whooooo can it be? Hardcover. Picture Book. Ages 5 - 7. Scaredy Squirrel Prepares For Halloween: A quirky safety guide combines practical tips with step-by-step instructions featuring an anxious Scaredy Squirrel, who prepares himself for the worst during the spookiest night of the year! Hardcover Picture Book. Ages 4 - 7. Autographed Bookplate by Mélanie Watt. Ghost Dog Secrets: Each day, sixth-grader Rusty feeds a dog that's left chained in the frigid weather with no shelter, food, or water. When he realizes the dog has been injured, he tries to have Animal Control help - but when that fails, Rusty and his friend Andrew unchain the dog and take it. With the dog in their hideout, the boys face multiple challenges, including Andrew's snoopy sister and the escalating threats of the dog's abusive owner. Even more challenging? The appearance of a ghost dog that appears in Rusty's room, and is trying to lead him to an even deeper secret. . . . Paperback. Ages 9 - 11. The Ghost's Grave: What Josh thought would be the dullest summer of his life, spent with his eccentric aunt, turns chilling when he meets the ghost of a coal miner killed in a mine explosion. Willie has been waiting years for some kind soul to dig up his leg and rebury it with the rest of him--only then will he be at peace. Josh agrees to do the grisly deed, but when he digs in the old cemetery, he finds more than Willie's leg bones. Who buried the box of cash in the grave, and why? How far will that person go to get the money back? Paperback. Ages 8 & up. The Book of Ghosts: If you're weak of heart, beware. Don't turn a page of this book. Or if you dare, do so at your own risk. The tales within it's pages will haunt long after this book is closed, when the lights have dimmed and something -- somewhere -- is lurking. Is it the thunderous beating of a heart, the silent ascent of a headless horseman, or perhaps a demon arrived from the underworld through a secret portal? The master of all things magical, Michael Hague, delves into the formidable realm of ghosts. 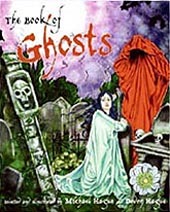 Adapted from legendary writers Edgar Allan Poe, Washington Irving, Oscar Wilde, and a host of others, the classic ghost stories within this collection will send shivers up and down your spine. Hardcover, All ages. Book Plate Autographed by Michael Hague. The Graveyard Book: A delicious mix of murder, fantasy, humor, and human longing, the tale of Nobody Owens is told in a magical, haunting prose. A child marked for death by an ancient league of assassins escapes into an aboandoned graveyard, where he is reared and protected by its spirit denizens. Ages 9 - 11. 2009 Newbery Medal Winner. Beastly Rhymes to Read After Dark: "Parasite Lost" and "Leap Halloween" are two of the amusingly spooky rhymes offered to readers in this Halloween-inspired poetry collection enhanced with bright illustrations and fake monster fur. Hardcover, Ages. 6 - 7. illus.by Brian Biggs. Bookplate autographed by Judy Sierra.